The University of Oxford has launched Ancient Lives (ancientlives.org), a website featuring hundreds of thousands of images of fragments of papyri written in Greek. Members of the public are being asked to help decode papyri. Researchers say that ‘armchair archaeologists’ visiting the website can help with cataloguing the collection, and could make amazing finds, such as the recent discovery of fragments of a previously unknown ‘lost’ gospel which describes Jesus Christ casting out demons. So now anyone can dig for new NT papyri! The first fascicle of the Vetus Latina Iohannes from Herder, covering John 1,1-4,48 has been published! Work began in Birmingham on this comprehensive new edition of the earliest Latin versions of the Gospel according to St John in 2002, with the Verbum Project on the earliest manuscript witnesses, funded by the Arts and Humanities Research Board. This was followed by the Vetus Latina Iohannes project on quotations of the Gospel in Latin writers up to the ninth century, funded by the Arts and Humanities Research Council from 2005–2010. Read more here and on the ITSEE blog here. The ITSEE Blog seems to have substituted David Parker's blog "Editing the Gospel of John." Now you can find several interviews on iTunes-u(niversity) produced by Vrije Universitet in Amsterdam, one of which is between Lietaert Peerbolte, Professor of New Testament Studies and Jan Krans, Professor of New Testament studies centering on subjects of interest, Codex Sinaiticus, the King James Bible, etc. A new blog has seen the light a few days ago, Paleografia Greca, with an impressive number of posts up already. The blog is devoted to Greek palaeography, or more general, to the history of Greek literature from its origin to our days (with a focus on the Byzantine era). This blog will be of great interest for our readers (it links here, by the way), as can be assumed from the very blog header displaying an evangelist portrait (Gospel of Luke) – but I wonder which MS it is from. Update: Daniele Arnesano tells me the portrait of Luke is taken from Wien, ONB, Theol. gr. 302, f. 17v. at the Department of Theology for a period of two years, beginning per agreement. The Faculty of Theology is the oldest of ten faculties at Uppsala University and encompasses all areas of religious studies at both the undergraduate and postgraduate levels (M.A. and PhD): History of Religions, Biblical Studies, Church and Mission Studies, Systematic Theology, Ethics, Psychology of Religion, and Sociology of Religion. The Faculty of Theology is one of Sweden’s largest institutions for education and research in theology and religious studies. The position as Postdoctoral Fellow in New Testament Exegesis involves primarily pursuing a research project of choice (e.g. a new monograph project beyond the published dissertation). Kelhoffer tells me that research in textual criticism is welcome. If anyone is interested I can assist with advise. 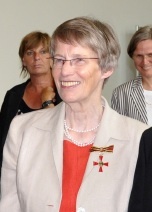 The former director of the Institut für neutestamentliche Textforschung in Münster, Professor Barbara Aland has been awarded a German order of merit, "Bundesverdienstkreuz am Bande" (equivalent to the Knight's Cross) by Bundespräsident Christian Wulff, specifically for her work on the New Testament text. She received the order from the hands of Regierungspräsident Dr. Gerd Bollerman in a special ceremony last week. The British Library along with Durham University and Durham Cathedral are raising funds to purchase the 7th century Latin gospel of John which was buried with St Cuthbert. How much does an early Latin gospel in pristine condition cost? A mere nine million pounds ($14.5 million). Check out the BBC video below. 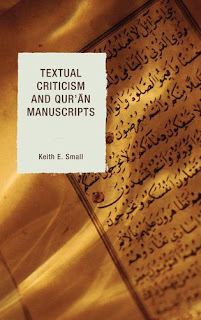 Although not entirely relevant to this blog, we should note the publication of Keith E. Small's Textual Criticism and Qur'ān Manuscripts. 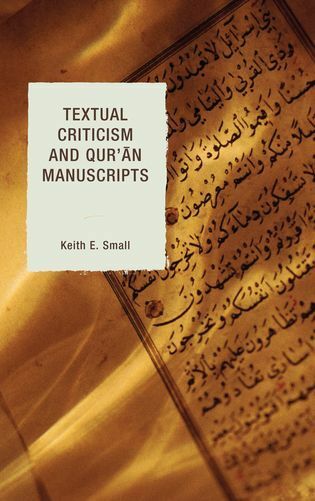 Small's PhD was a comparison of textual variation in NT and qur'anic mss, and it is the focus on the latter which is published here. However, because of his experience in NT TC there is comparison with the NT, and interaction with familiar scholars (Epp, Metzger, etc.). The study examines 22 mss of Surah 14:35-41: 'nineteen from Islam's first four centuries and three from within the last two centuries' (p. 15). Manuscripts considered include ones from Istanbul, San'a, Samarkand, the British Library (including of course BL Or. 2165), and eleven from the Bibliotheque nationale de France (often miscalled the Bibliotheque Nationale de Français). The analysis is divided as follows: orthographic variants involving long vowels, copyist mistakes, diacritical mark variants and variants affecting grammar, rasm (i.e. consonantal) variants, variant verse divisions, physical corrections to manuscripts. Mark and Matthew I. 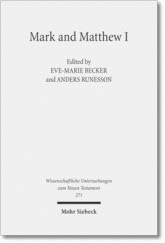 Comparative Readings: Understanding the Earliest Gospels in their First Century Settings, edited by Eve-Marie Becker and Anders Runesson forthcoming in the WUNT series (Mohr-Siebeck) will be published in August. The volume of essays brings together the contributions to the first conference held in Århus, reported on here, here and here. Of particular interest to readers of this blog will be the essays on textual criticism by Barbara Aland, "Was heißt Abschreiben? Neue Entwicklungen in der Textkritik und ihre Konsequenzen für die Überlieferungsgeschichte der frühesten christlichen Verkündigung," and Tommy Wasserman, "The Implications of Textual Criticism for Understanding the ‘Original Text’." The study of Mark and Matthew from a comparative perspective has a long history. Ever since the theory of Markan priority became firmly established in the 19th century however, many studies, especially commentaries on either Mark or Matthew, make observations related primarily to one of the Gospels only. Thus the most frequent result of studying Mark and Matthew is that one Gospel is overshadowed by the other. This collection of papers employs a sustained multiperspectival comparative approach which contributes simultaneously to the synoptic problem discourse and sheds light on the individual Gospels in their first century setting(s), a procedure that reveals new questions and discoveries. This highlights new aspects of the Gospels which are critical for our understanding of the rise and development of Gospel literature in the first century C.E. If you want to catch up on all that's been going on in New Testament textual criticism in the last few years, there is no better resource than Hugh Houghton's recent article in Early Christianity 2 (2011) 245-268. Those with an institutional subscription should click here. Otherwise, the article is available (minus final format) from Hugh's own institution. It's also a good overview of the status quaestionis.